Explore la antigua Roma en este tour guiado de 2 horas en grupos pequeños. 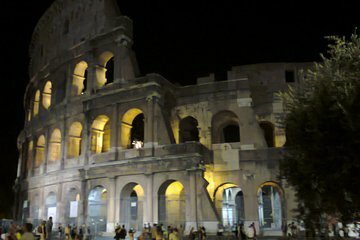 Visite algunos de los sitios más populares de Roma, como el famoso Coliseo, también conocido como el Anfiteatro Flavio, el anfiteatro más grande jamás construido, y el Foro Romano, rodeado por las ruinas de varios edificios gubernamentales importantes. Elija entre un horario de salida de 9 am a mediodía y al mediodía y disfrute del acceso directo a la red para ver los sitios más pronto. Firstly our tour guide Francesca was brilliant 5 stars- very knowledgeable and enthusiastic. Why I only gave this 2 stars was the planning. We were told on the ticket to meet at 12pm at Via Tolemaide which is 1hrs march 5km away from the Colosseum. Time was important to us because we had to leave Rome at 3pm. The lady behind the desk first said we would need to wait until 1pm until the tour would leave. We couldn't afford to waste 2 hours short time in Rome hence went for half day tour so she instead said we could meet our guide by a green box outside Colosseo Station at 12:40. We legged it to the station got 2 trains paid for by ourselves and managed to find our guide. Warning lights should go on with the location of the departure. I think the office mainly caters for Vatican City tours. Whilst discussing this with the lady in the office she seemed unfazed by the mess up and continued to serve other people who were buying VC tours it was infuriating! But the tour itself was excellent! If booking I would advise asking to meet at the green box outside Colosseo rather than traipse up to Tolemaide. And ask for Francesca.